Replacement:ROB-11578. These have been replaced with an improved aluminum version! This page is for reference only. 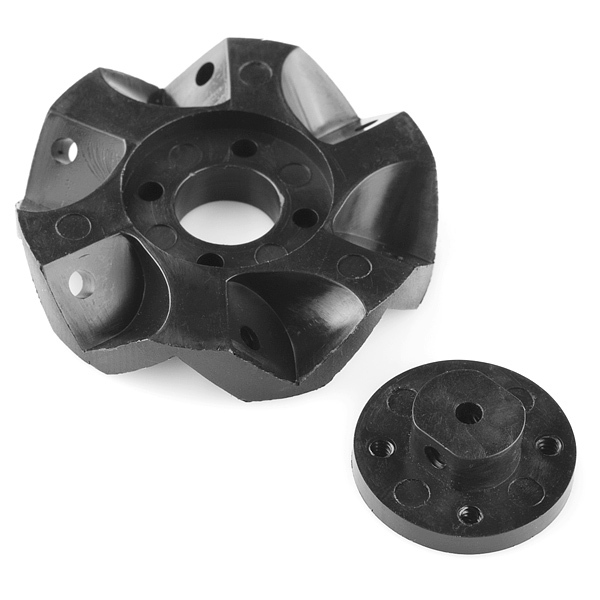 Mecanum wheels allow your robot to not only travel forward and backward, but also side to side. Using rollers set on a 45° rotational axis parallel to the main rotational axis of the wheel, it allows sideways movement as well as forward and backward movement! These wheels come in sets of 4 and require some basic assembly. A small hex wrench is included with each wheel set. These will mate directly with our micro gear motors. 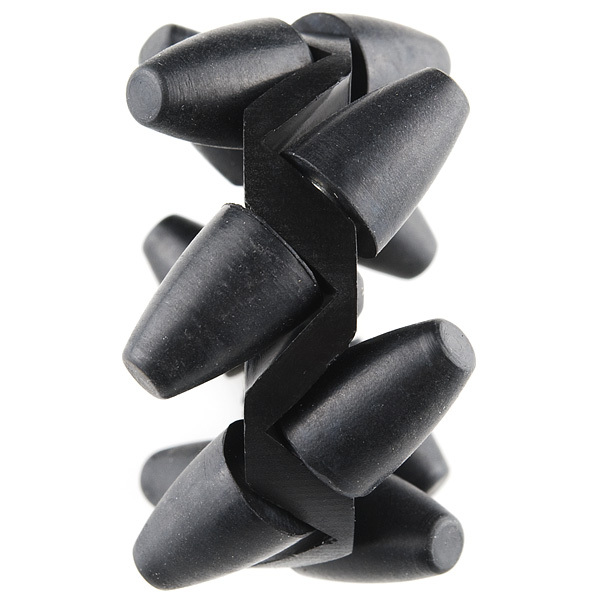 If using it with other motors, you can easily drill out the hubs to accept larger shafts. Notes: For the best performance, there a few things you should know. The wheels might need a little lubrication to get the rollers moving well enough for lateral movement. Some basic grease works well. Since lateral motion relies on the motors moving against each other, you will get the smoothest lateral movement when the wheels are traveling at the same speed. The use of encoders (or some feedback loop) is recommended. Lastly, making sure your robot platform is balanced helps tremendously as well. Too much weight in the front or back can cause poor results. Outside wheel diameter - 2.125"
Oh yeah - for everyone complaining about the price : a friend of mine bought 2 x 8" diameter non-motorised metal omni wheels (admittedly with bearings for each of the rollers) about 18 months ago, and they cost him US$1370.00 - plus shipping. So $70-ish bucks for 4 of these is a steal! You have to offer these now?!? I just rapid prototyped a set for 120$ Awesome, now I'll have a backup set. That just justified the cost of this set for me! 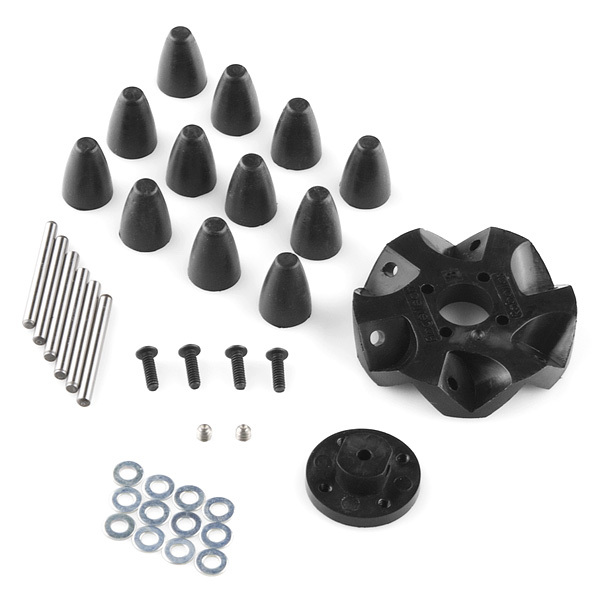 Vexlabs started carrying a quad of Mecanum Wheels for $59.99. 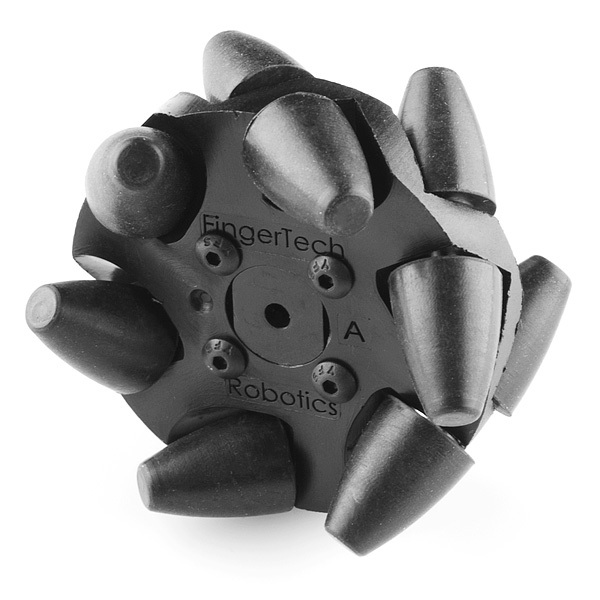 They are larger (~4" diameter), and designed for heavier robots. So, no longer cheapest available. Maybe you guys should start carrying some of the Vex stuff. The Vex Mecanum wheels are awesome! Take a look at a Rover 5 with the Vex Mecanum wheels here. Another video as it attempts an autonomous figure 8. I also have a set of the above wheels. They cost more and are not nearly as good as the Vex wheels. These FingerTech wheels are easier to mount and smaller but not worth the money in my opinion. Using encoders makes a big difference when driving Mecanum wheels. +1 on the recommendation to switch to Vex mecanum wheels. I bought both and there is no comparison. The Vex wheels are $60 and infinitely better than these awful Fingertech wheels. Quite disappointed; these are NOT high quality wheels, although sadly they are the only option available. They hop & bump & bumble & skip, even at low speeds, like rolling on hexagonal wheels. The only "bearing" is the steel shaft spinning in the central housing, so there is lots of friction when the roller tips touch the ground. Do not expect to match the smooth motions you see in Youtube videos of Airtrax forklifts. Your chassis needs to swivel axially to achieve any driveablity at all. add a tiny bit of lube to the axles and they work well for smaller robots. Did that, and removed flash, and made custom delrin washers to replace the stock steel ones, and polished the axles, and modified my chassis so the axles pivoted to ensure all 4 wheels touched the ground evenly. Still unacceptable performance. Would be OK if the price was $20 for all four wheels, but these are horribly overpriced at $75. I suspect your motor drivers or motors aren't powerful enough? I beg to differ. I'm using four Futaba continuous rotation servos with gobs of torque and excellent low-speed control. Square chassis layout, exactly 25% weight on each wheel. The two big problems are: 1) too much friction on the wheel's roller shaft (bad design), which varies as the contact point on the roller changes. It's worst at the roller tip, when the shaft is really cocked in that small "bushing" on the main wheel, and 2) wrong roller profile: the proper geometry should roll smoothly as the wheel rotates. The current design hops and stumbles as it rotates, like a hexagonal wheel. There's nothing smooth about it and all that hopping makes & breaks contact with the ground even with pivoting axles at low speed. That introduces lots of chatter and random motion. Sounds like you are doing everything right. They are tricky to get to work, as I've shown in the video when we launched them. contact customerservice@sparkfun.com if you are unsatisfied. sorry about that. Hi everybody, I have built a mecanum wheel robot using the same wheels The robot goes forward and backward very well , but it wiggles when in left and right motion. IAny idea what the problem can be ? should the speed be the same for left and right motion or they should be different ? I saw these on a forklift in the background of the "shuttles depart the academy" scene in the 2009 Star Trek movie and wondered what in the heck they were. I thought at the time they were just set dressing trying to 'hi-tech' a humble forklift, which I see plenty of in my 'day job'. I'd since seen them on a forklift shown on Mythbusters, and thought that M5 built the things for the movie... Come to find out they are real, really real, and useful. I find it interesting that these wheels allow for removing the steering package on one or both axles of your bot. Stronger frame and let parts to go wrong on the base package at the cost of slightly more complicated wheels, nice. Anybody has the 3D model of this product for solidworks 2006? Im having a hard time mating these with micro motor gearbox, Any help? Are these any good in a three wheel configuration? Nope. With only three wheels, you would lose your ability to move sideways. I have two of these bots and it is 3 wheel, any direction. I'm building rc robots, from electric wheelchairs and selling them! I'm sorry, but that's wrong. The math is a little different but you can still move any direction you like. Yes, the wheels are softer rubber, not hard plastic. They have grip. I was almost drooling as I first saw these nice babies, until I learned how they're designed to work. For anyone interested in using these wheels, be aware that you need one motor per wheel in order to use their amazing directionality! That's not a huge deal for most typical 2-wheel-drive 'bots, but there's no way a single-motor 4x4 chassis can be easily modified to drive 'em. Since 4 small motors are much less efficient than one large one, I'm snookered power-wise too. Oh well - looks like I need to go back to ze drawinkboard! Can you make a kit out of the Rover 5 robot in the picture? Or at least list all components required to build it? We don't plan on making a kit. The electronics choice is really defendant on your project. Many different combinations will work. We just used an Arduino Uno, the baseplate, and XBee shield, and some motor drivers. If you were going to add the encoders, you might need more hardware. Which motor drivers did you use? We're looking to remake a wireless tank/robot demo for our LabVIEW interface. Were these a 4 pack last week? I totally missed that! Hence me thinking they were very very expensive! Yeah these are sold in a 4-wheel set. Wouldn't do much good to have less than four! Awesome job guys! I always wanted to play with them! Can you post a picture of the wheels assembled from the side (so perpendicular to the axle) so we can see how round they are? ..... $75 for 4 wheels no bigger than my palm.... What are you guys thinking? Your markup is atrocious! And these things don't come preassembled either? Thank god i have plastic forming machinery, because these prices make me want to puke, i can make my own for less than $10 and 2 hours of meticulous work, which is better than paying $75 and waiting 8 days for them to travel over 1 state.... Good prices. While your at it, why don't you make your microcontroller too? The price for these is actually quite reasonable. Mecanum wheels are atrociously expensive and it has nothing to do with markup. It has to do with demand and complexity. That's what we thought. These are the cheapest out there. And very few people are making their own. You don't have to buy them. These are the cheapest mecanum wheels around. And not everyone has a 3D printer. Or et-least I don't have 1k for a printer. Here is a video of Mecanum wheels on a R/C? platform. I've got a set from the manufacturer that has been upgraded with special bearings, to give a mutch smoother drive. The only way these wheels work is because there are 2 different wheels. they are mirrored left and right, for and back. A disadvantage of these wheels is the efficiency and control trouble. Autonomous drive is hard with these wheels, because there are plenty of variables that are hard(er) to predict. But thats just a challenge. The efficiency of these wheels is the square root of 2 (theoretical...) because the inner rollers are turned by 45 degrees or 1/4pi rad. Its worth it to google "macanum wheels", "mecanum algarithm" for nice information like an algarithm that makes your robot. It will also explain the square root of 2. ATM I'm busy designing a robot with this type of wheels, from scratch. When I'm done you'll be able to download the plans from thingiverse.com (they have open source macanum wheels too...). Woah - 75 bucks - thats a lot - what makes them so expensive? are they hard to find? have lots of complex parts? An important part is missing in this pack. The sparkFun stickers on the hub shown on the Rover! Actually the technology isnt that new, i saw one a couple of years back on a fingerlift in a factory warehouse. Airtrax is the company. They ran out of money (including some of mine) and now exist only to license the technology to ... nobody. typo.. it should say "A small hex wrench is included" not "AN small hex wrench is included..."
Your video didn't make it clear how you select the mode that the wheels operate in. I kinda figured it had something to do with turning the wheels in different directions which makes 16 different possible combinations. You should publish a chart showing them. Not sure if these come with instructions, but another helpful tip is to make sure the wheel rollers make an X pattern when looking from the top down. O my god, I must have a set !!!! Considering there are 38 parts for each wheel x 4 wheels = 152 parts. That's only 50c a part. Actually, I think this is the cheapest you can get them online at the moment. Right, because its some hot new patented tech, and the cost is covering innovation and investment I guess. It would be cool to see royalties on stuff like this suspended for student / research use (voluntarily by the mecanum, not as a law) - seems like that would be pretty win-win to me. The US Navy has owned the patent since the early 1980's. The basic invention is fairly old (I'm sure wikipedia can help out there). The specific implementation may be patented, however. Regardless of any patent issues, though, there just hasn't been much of a market for them in the past (control issues, for one) and even now; how many robots absolutely need to 'strafe', rather than just turning the wheels (with either a small turning circle) or swiveling the wheels? Yeah, these seem to be pricey. If you guys want cheaper, there are some slightly smaller wheels for $12 from Acroname (also a great place!). And some slightly larger ones for $43. Note these are a different style. Also, I have a bunch of these (the one above, from acroname) and really don't need them. I never used them much either. If someone wants to buy them from me, I'll give them a fair price. E-mail me at my username here, at gmail. Mecanum are very different from what you posted. With a traditional robot platform, mecanum wheels can accomplish a full range of movement. The wheels you posted require a different configuration. Ah, yeah, I forgot about that! These work well with a 4 wheeled vehicle, and the ones I posted work well with a 3 wheeled vehicle. Either way, the ones from acroname are cheap and you guys should carry them too!